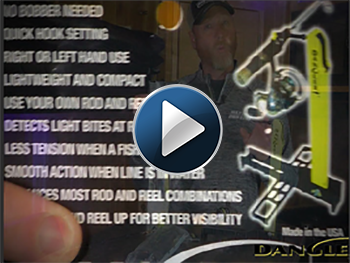 The ability to detect the most sensitive of bites and react quickly is key to ice-fishing success, and the Dangler Rod Holder helps you do just that. With the Dangler Rod Holder, your balance point is on the top of the rod, which offers a much more sensitive bite detection system than most tip-down rod holders. It's made of rugged nylon with a stainless tempered-steel release wire in a lightweight, compact and portable fold-up design. The rod tip is elevated for enhanced visibility so you can detect the lightest of bites without using a bobber and hook setting is both quick and smooth for right or left handed users. Fingertip jigging is a snap, and a breeze adds even more bait action. Balances most rod and reel combinations. Dangler Strap and Universal Strap included with Dangler Rod Holder purchase.